The OGA was set up to preserve the distinctive traditional gaff rig and in the early days this entailed rescuing or preserving lovely old boats. Now gaff rigged boats are being built again; some even using traditional methods and materials and gaffers are more popular than ever. The OGA has developed into a flourishing nationwide association with affiliated associations far and wide: in Ireland, France, the Netherlands, Belgium, USA, Canada, Australia and New Zealand. The OGA is an organisation of practical sailors. Development of the skills of sailing and boat-handling is encouraged and the crafts of traditional boat-building and maintenace are championed. Regional areas organise events locally and members can participate whether or not they own a boat of their own. There is a Trailer Section for members who have the flexibility of a small boat that can be towed. 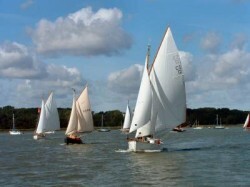 Typical events include weekend sails in local waters; longer family orientated cruises in the summer; barbeques on beaches; musical evenings on board and racing at various town regattas. In the winter talks, quizzes, pub evenings and singsongs are organised. regular emailed newsletters for your own Area and a second Area of your choice. The OGA also takes on the documenting of histories of the older boats and preserving old photographs. A Boat Register is maintained.